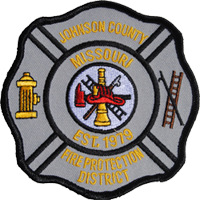 Established in 1979, the Johnson County Fire Protection District is a tax based entity that serves 525 square miles in the eastern two-thirds of Johnson County, Missouri excluding the cities of Knob Noster and Warrensburg. Governed by a three person elected Board of Directors, the District is a 24-hour per day service with a full-time Chief and Assistant Chief, a full-time Captain, three full-time Firefighters, and more than 130 volunteer members from diverse backgrounds. The District has eleven stations located in or near Centerview, Chilhowee, Columbus, Cornelia, Fayetteville, Knob Noster, Leeton, Valley City and Warrensburg. A twelfth station is currently being constructed southwest of Whiteman Air Force Base. Four full-time firefighting personnel are stationed at the District Headquarters in Warrensburg. These personnel are on duty Monday-Friday from 8 AM to 5 PM and respond throughout the entire District to supplement the response of the volunteer personnel. Fire suppression remains the foremost function. The District responds to various types of fire related incidents and also provides rescue services for motor vehicle accidents and as needed for other rescue related incidents. The District’s Station 11 provides water rescue services for Johnson County. Public fire safety training is available for schools, public service organizations, youth groups and other community events. The Fire-Weather Safety House is utilized for a hands on training approach in fire safety and severe weather training. Providing modern innovative fire suppression to all citizens of the District remains the primary focus of the District. Training of fire personnel and public education/awareness are two of the methods employed to help achieve this goal. With the continued support of the public the Fire District will continue to change allowing equipment to be purchased and upgraded to provide the dedicated men and women of the volunteer force the best equipment to complete the various tasks required to provide service to the entire District. Want to Help and Join the Fight?